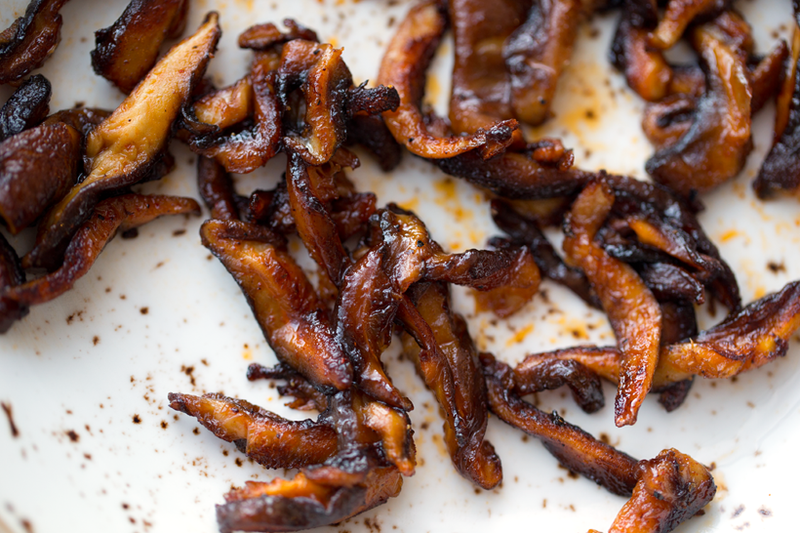 This super easy vegan Shiitake Bacon is sassy and smoky with a hint of sweet. Perfect for topping soups, salads and sandwiches. 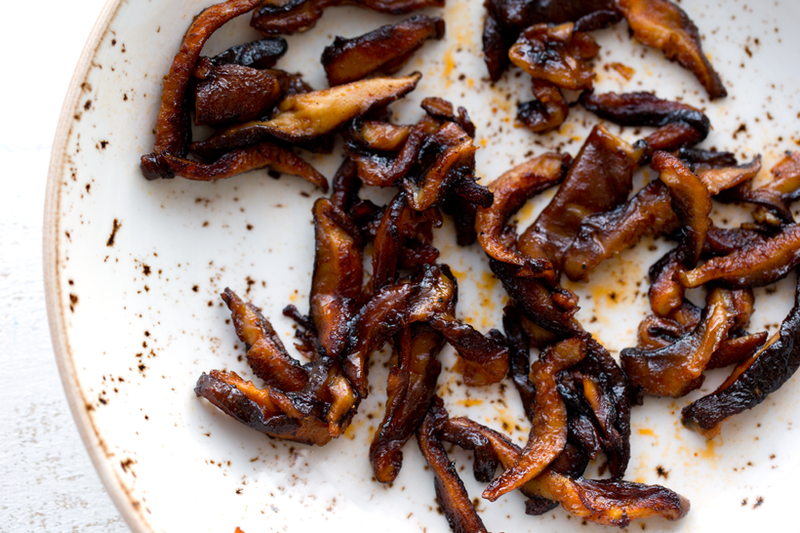 Get the recipe and find out why I still call it shiitake bacon, even though people hate that word.. I know, I know. Why am I calling this bacon? If I want to eat bacon, just eat real bacon right? Or that is what at least one person always says when I call vegan foods "bacon" or "cheese" or some other word that is classically from animal products. And sometimes I agree. But I also think this is a complex little topic. I even wrote a whole post about 'fake meat' and titles a few years ago. But the reason why this is indeed Shiitake Bacon is because the word "bacon" immediately alerts people to the many ways they can utilize this deliciousness. Use this shiitake bacon it as a salad topper. Stuff it into sandwiches and pitas. Garnish big, creamy soup bowls - like my broccoli potato soup - with it. Or just nibble it straight from the skillet. (And tomorrow I will post my recipe for how I used this shiitake bacon. OMGoodness so yummy and perfect for this weekend's Super Bowl ... or Puppy Bowl .... or I-Hate-Football-Bowl. You see, from years of blogging experience, I know that if I called it "skillet shittake mushrooms" people would assume it was a veggie side dish. So three cheers for plant-based bacon. Call it what you want, just go on a make it! It is deeee-licious. Side thought... Life Stuff or Recipe or Both? I am so bad at separating food from life guys. I try so often to write personal stuff in my recipe posts but those blogposts then end up being wayyyy too long. So I just don't know. I guess I could post "life updates" in separate posts with separate themes? What do you guys think? Or do you like them embedded into the recipe posts? Love your feedback on that ongoing tiny blogging challenge I seem to be having. Now this bacon! Yes, it is bacon. Meat free, cruelty free, pigs-love-this-recipe bacon. Reclaim "bacon" with this sizzling skillet..
Smoky, spicy and a hint of sweet! This easy to make vegan bacon can be used in salads, sandwiches and as a soup topper. Warm a skillet over hight heat and add the oil. 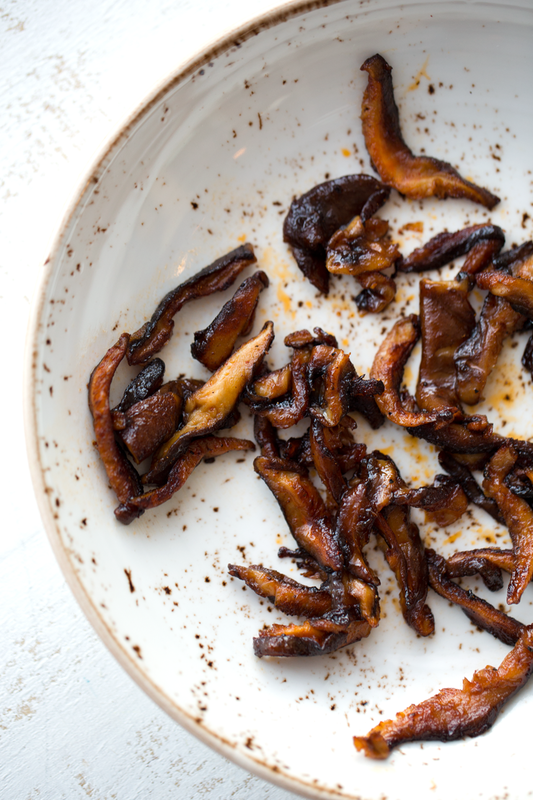 When oil is hot, add the shiitake mushrooms. 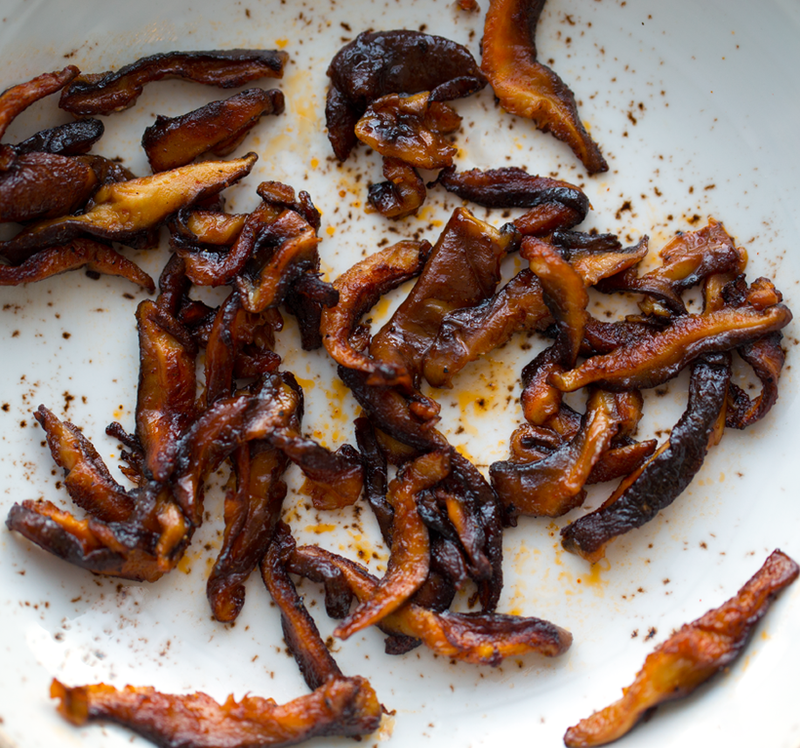 Tip: If you have time, add the tamari and some paprika to the sliced mushrooms a few minutes before and allow those flavors to marinate into the mushroom. Otherwise, just toss everything in the pan and that is fine too. Spread out the mushrooms in a thin layer in the pan. Cook 1-2 minutes. Add in all the remaining ingredients (except the optional vinegar) and stir them into the pan. Let the mushrooms sizzle in the pan for as long as they need to absorb all the liquid and spices and start to caramelize. Finish with a splash of the vinegar to de-glaze the pan a bit. Wiggle pan one last time and turn off heat. Let the mushrooms rest in the pan for a few minutes before using in recipes or transferring to serving bowl. Cook time: 00 hrs. 07 mins. Oh and if you love this recipe you will love my tempeh bacon too. Also sassy and smoky with a hint of sweet.